• Easy –tosit, poly urethane seat surface. • Strong yet soft, semispherical, height adjustable backrest, offers optimal elbow, upper body & back support. • Stable, epoxy coated five pronged base. 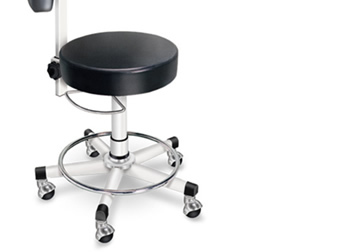 • Sturdy smooth surfaced (chrome plated) bottom ring for footrest. • Smooth movments through five highquality castors.